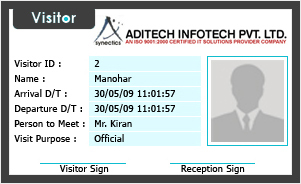 What is Aditech JustLook Visitor Management System? In many organizations, it is necessary to record the basic of every visitor for the purpose of security. In the past, organizations need pen, paper and precious time to track the name, address and many other important details of their visitors. And for large scale organizations, it seems to be the most difficult and time consuming task to keep record of every single visitor entering their premises in every minute. But with the latest innovations done in the field of IT security, many systems have been invented to ease the task of recording visitor’s entry and exit. And one of the important systems is called Visitor management system. JustLook Visitor Management System is the best way to record the entry and exit of every visitor. Our system is designed to authorize, identify and track the behavior of large number of visitors. Organizations that have to handle a large number of visitors like Government premises, corporate offices and heavy industries are top on our clientele list. Also, our visitor management system serves a varied range of solutions with respect to the requirements of our clients. Our clients can also ask to customize the security solutions in accord with their necessities. The system reflects a professional image of the company, as it allows the visitors to enter into the premises without wasting their time. It improves the security of the company by accurately recording all the minute details of the visitors along with their facial patterns. The management can also generate graphical reports at their decided time intervals in order to check their security measurements. The system can be fully customized in accord with the requirements of the company and it can be upgraded with the growing demands of the company. The management can also set appointments, confirmation of appointments and various other features in the system. And these features are also fully customizable with the necessities of the management. It also provides alerts via sms or email to the management at the time of arrival of appointed visitors. With its zero cost of maintenance, it allows the management to save their administrative cost. It automatically detects the entry of new visitors and can automatically enroll the entry of repeat visitors. It also allows the users to create blacklist to block the entry of unwanted visitors into their premises. It is easy to use, simple and affordable security solution.